Event photography courtesy of Chris Ma. In March I received an invitation to FORM + FASHION featuring designers Xsenia & Olya. My quick response was an eager YES. These emerging artists have been creating a buzz in the industry for the last few years and I was excited to see what they were bringing to the table for fall in particular. A few days after the event there was also an opportunity for me to sit with the brand's business manager, Anastasia Seleznev, who works closely with the team from initial concept to final collection. Most of that interview will be the foundation for a future article, but it did open a window for me on the designers' unusual path to creating the collections I saw that evening. Xsenia Runa and Olya Shishkina met while studying fashion design at Central St. Martins in London. Their collaboration since graduation has resulted in a unique line of garments created using cutting edge technology that is also easy to wear. Let's face it, today's woman wants to look amazing, yet be comfortable while doing it. In talking with Seleznev, what was most interesting was the hands-on process used to inspire the digital prints. Both collections were inspired by movement, but for Spring/Summer '13 it related to the physical world. They filled a bathtub with water, used their hands to generate small waves and photographed the fluid surface patterns created . For Fall/Winter '13 the focus was more conceptual - the movement of time. Images of clocks were layered into a unique collage which was then scanned into the computer. Images were digitally manipulated to hone a final concept and then used to create each season's original prints - a trademark of the brand that has propelled them into the public eye. 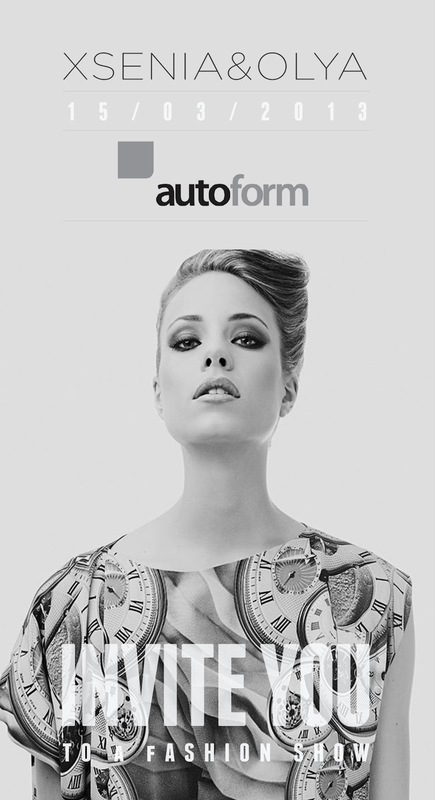 FORM + FASHION was held in the AutoForm luxury car dealership on Clark. Valet parking and a spacious venue set the tone for the evening. A runway lined with white chairs surrounded by lots of standing room offered a greeting as you entered. To the right was a small boutique space where we could shop after the show. Next came an area to relax and mingle offering a bar, cocktail-style standing tables to chat at and a long buffet laden with cheese, fruit and other nibbles. Last but not least was a large showroom where several high-end cars tempted us - "Take me home!" What I really loved at this event was seeing so many new faces in the crowd. All around me were men and women I did not know dressed to the nines enjoying a drink, sampling the buffet, engaged in lively conversation and swaying to great music spun by DJ Adoriana. The evening's show opened with a warm welcome by emcee Devon Brooks and then it was on to the main event. Xsenia & Olya offered us 2-shows-in-one. First was a look at their current collection available in stores now. Then came a peak into what we could expect for fall. It's hard to sit through a runway show knowing it will be 6 months before you can add that favourite piece to your closet. This format lets you satisfy your craving for something new with the current season as well as whet your appetite for pieces you will get to add in the future with a preview of the next season. Spring/Summer '13 was a warm, inviting cure for the cold and rainy weather outside. The conceptual prints were offered in a range of colours - pink, yellow, red/orange, turquoise, cobalt blue, purple, etc. I am a huge fan of turquoise and asymmetry, so it's no surprise the piece I most wanted to own was one featuring both of these elements - the first image on the left below. While this is a hip super short dress for the young and lean, it also would be great paired with a slim complimentary skirt for those of us who would like a longer silhouette or with white, calf-length leggings for wandering the beach at a resort. What all looks had in common was an eye-catching aesthetic combined with a relaxed, comfortable fit. Fall/Winter has always been my favourites season, so I really looked forward to this segment and ended up wanting to own several pieces. The long dress on the left below was a great mix of classy and elegant that could be worn at a wide variety of events. I also liked the look of the dusty blue dress (or top and skirt) in the centre below, but would personally need to pair it with something to add a little length.Then the grey toned print dress next to it...and...and...you get the idea. The palette for Fall/Winter '13 was more subdued, but there was still a distinct vibrancy - due partly to the hues chosen and partly to the intriguing digital prints. Both collections featured natural fabrics with one exception - a soft pastel used in silhouettes featuring fabric fringe. Fringe was laser cut to create a light, flirty detail that moved freely - so a quality synthetic was needed for the process. Two of examples are shown below - one with a square fringe that covers the entire dress and another where it is used in the fringe skirt. Special thanks go to everyone who contributed to make this evening possible: Autoform for the venue; Smashbox Canada for make-up; Pink Lime Salon for hair; DJ Adoriana for the music; Austrian enamel jewelry brand Frey Wille Canada for the accessories seen on the runway - sold through their exclusive boutique at 511 Howe Street; and photographer Cliff Ma for the images. 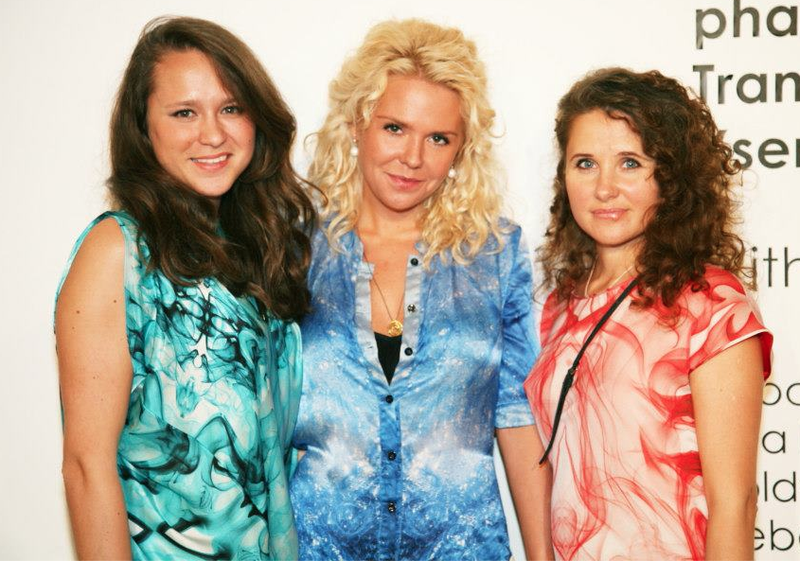 Xsenia & Olya's spring collection will be available in Vancouver at Vetrina (525 W. Georgia). If you missed this event, the designer's will next be showing their collection at Ladies Who Lunch on June 8th. Tickets are available through Eventbrite. For more information or to contact the designers, please visit their website at www.xsenia-olya.com/.